Inspaired by several artsworks of Yoji Shinkawa, a japanese character designer and artist who work for Konami. A company where my favorite game series Metal Gear Solid was born and where he is working now as a art director for this and other different projects. Here comes my next painting project in step by step, from the idea to a final blow! One of the greatest games of all time that came out in 2005 on PS2 (and also later as the HD collection for a PS3). Amazing landscapes, gigantic titans, that just wait to be found in a massive world which can be explored on a horseback. I am going to bring that memories back by painting one of the stunning images of this series over three 70x50cm canvas screens. Inspaired by several artsworks of Yoji Shinkawa, a japanese character designer and artist who work for Konami. A company where my favorite game series Metal Gear Solid was born and where he is working now as a art director for this and other different projects. Here comes my next painting project in step by step, from the idea to a final blow! There was a artist and painter in ancient Japan called Katsushika Hokusai (葛飾 北斎). He did the most recognizable Ukyo-e (浮世絵) woodblock printing series that is well known outside of Japan, Thirty-six views of mount Fuji (富嶽三十六景). 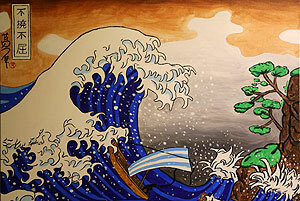 This series includes one painting, called Kanagawa oki nami-ura (The Great Wave off Kanagawa). Exactly this one had a big influence on me and made me interested in Ukiyo-e.
After the jump you can have look, as I'am trying to draw my own oki nami-ura on canvas with acrylic colors.